If you have Reports that you run regularly you can pin them by clicking the green pin icon. Name the report and click ‘pin report’ to save. This gives you quick access to your most popular Reports. You can pin as many different reports as you like. To run your pinned reports, click on ‘Run a pinned report’ and select one from the drop down list. To remove a pinned report, click on ‘run pinned report’ and select the report you want to remove. 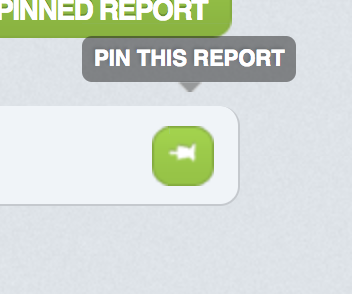 Click on the green pin icon to unpin the report.